I have been using the Estée Lauder Advanced Night Repair products since early Autumn 2009. Both the Synchronized Recovery Complex and the Eye Recovery Complex have been very good to me over the past few months. They were prizes; I love entering competitions (read more about my hobby here) because its a great way to find out about new and existing products which you wouldn't otherwise buy; every once in a while, you get to try out a product where the competition really does achieve its goal – you become a convert and will go back to buy the product time and again. Now that I am approaching the end of the bottles of Advanced Night Repair, I have been evaluating whether or not I love them enough to justify forking out real cash for them when I run out. The Synchronized Recovery Complex is an anti-ageing serum that you apply to your skin each evening beneath your existing moisturiser. Using the integral pipette, you apply just four or five drops and then massage it onto your face and neck using your fingertips. The serum feels incredibly silky smooth on your skin and you'd be surprised how little you need to use in order to coat your entire face. Before I received these Estée Lauder products, I had been on the lookout for a new moisturiser (I've yet to find the perfect moisturiser and tend to flit from brand to brand). After using Advanced Night Repair for several months, I've found that no matter what moisturiser I use after the serum, that when I wake up in the morning my face feels well hydrated, soft and healthy. It has given me a chance to use up all the odds and ends of moisturisers with which I had previously fallen out of love. The Eye Recovery Complex is a restorative eye gel designed to reduce the fine lines around the delicate eye area. It has its own funky applicator (but fingertips will do just as well). It is recommended for use both morning and night but one of the things I love most about using an eye gel is that feeling of refreshment and renewal I get when I apply it after a long day staring at a computer screen as I sink down into my pillows at the end of the day. Sadly, there was no sense of refreshment with the Eye Recovery Complex. Don't get me wrong, it does feel gentle and non-greasy but it is missing that wow factor, that sense of zing and immediate recovery that I look for in an eye gel. After about two weeks using the Eye Recovery Complex, I could notice a difference to the skin around my eyes but since then, there has been no further improvement. I would be interested to see how quickly those barely perceptible signs of age return if/when I stop using it. 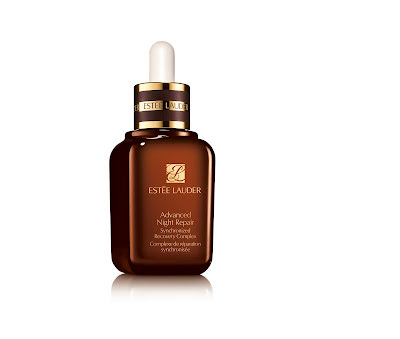 So, would I spend my own money on Estée Lauder Advanced Night Repair? Yes. Certainly (although I think I'll drop some hints to Mr. B. first and see where it gets me). I genuinely feel that over the past four or five months, my face has felt a lot healthier, more resilient to the winter weather than in previous years and generally more even in tone and hydration than I have ever known it before. I am very likely to be purchasing the Synchronized Recovery Complex but will have to consider carefully whether the benefits of the Eye Recovery Complex are great enough to compensate for the lack of wow factor. The Synchronized Recovery Complex is available from £36 and the Eye Recovery Complex is available for £33.50.